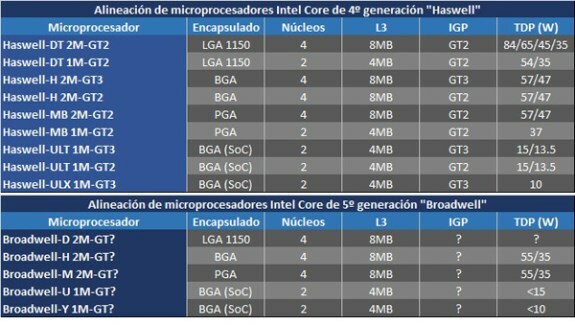 Intel Broadwell dual-core CPUs to be BGA-only? Asian tech site Expreview came across data that reveals the building blocks of Intel's Haswell and Broadwell processor lineups. As was the case with Intel's last generations, Haswell and Broadwell will basically consist of two physical dies; the 1M die with two cores and 4MB L3 cache, and the 2M die with four cores and 8MB L3 cache. The desktop Haswell chips will use the LGA1150 socket and will be available in dual-core and quad-core versions with 35/54W and 35/45/65/84W TDPs, respectively. All desktop models will come with the GT2 integrated graphics. The Haswell-H is Intel's line of mobile quad-core processors with BGA packaging, these parts have a 47/57W TDP and come with either GT2 or GT3 graphics, and then you also have the Haswell-MB chips with a replaceable PGA package, these processors will be available in quad-core versions with 47/57W TDPs and dual-core models with a 37W TDP. The Haswell-MB parts all have GT2 graphics. Last but not least Intel also has the Haswell-ULT and Haswell-ULX chips, these low-power parts use a BGA SoC packaging. The ULT models are dual-core parts with GT2 or GT3 graphics and a 13.5/15W TDP, while the ULX chips are dual-core parts with GT3 graphics and a TDP of only 10W. The information about the Broadwell lineup is less detailed but one important thing you can decude from the chart is that it seems to confirm the rumor that Intel will move away from the replaceable LGA sockets. The chart claims only the quad-core Broadwell desktop processors will have a LGA1150 socket, which suggests that most entry-level to mainstream desktop processors may have a BGA packaging, which means the chip is soldered to the motherboard.